GBWhatsapp for Android has become the best Whatsapp mode today, because of its great features and themes. One of the best and awesome features that can make GB users let Whatsapp looks more unique is by downloading and applying a theme to the app. Using GBWhatsapp theme has more features and many GB users don't know till now. Because When you download and try to apply GBWhatsapp theme on your android device, you will have the opportunity to get notifications when your contact friends are online or even when they change pic or view your status. 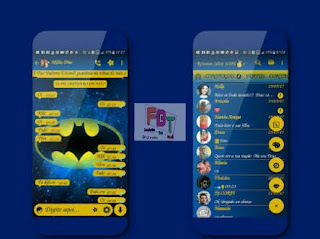 GbWhatsapp has a lot of themes where you can easily download and enjoy on your device without much stress, Today let me quickly explain how you can download and enjoy GB Whatsapp theme on your Android device. 1. If you don't have the latest Gbwhatsapp on your Device, you can Download it Here for free. 2. Once Downloading completed, Install And Launch the WhatsApp from your device then tap on on the Big + icon on the left side. 3. Now, immediately when you tap on the + icon, 3 icons will show up, quickly tap on the 2nd icon to download your theme. 4. Finally, wait a few seconds for all GBWhatsapp themes will comes up. Once it comes up kindly tap Apply to download your favorite from the theme. that's all once download completed. quickly restart your GBWhatsapp and enjoy.